Save money and have fun doing it! You get the satisfaction of doing the job yourself, but will not break your back doing it. Why pay a contractor while we can supply you with all the equipment and advice you need at ½ the price? You can mix and match attachments to have one machine doing all those jobs. 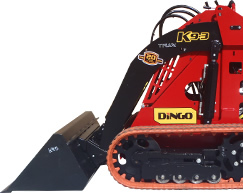 Instead of hiring a bobcat / operator and a trencher, get a Dingo with attachments and save money and time. Tradies: save time and money. Rent A Dingo will deliver a Dingo to your site, show you how to use it, then come back and pick it up! Imagine the time you’ll save. Get Your Quote Here. Don't forget: we do compactors / bricksaws and other hiring equipment as well. Check our hiring equipment. If you want a job done quickly, can't be bothered, or just not sure, then we can help. Our operators / contractors are fast and reliable, who have the knowledge to get the job done, saving you time and costs. 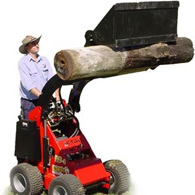 We have a large range of equipment available to do the whole job. From concrete saws, jackhammers, compactors to rollers. Why Choose Rent A Dingo? Rent A Dingo services the metro area and some other areas, 7days a week. All deliveries are done before 9.00am, and pick up at 5.00pm or the next day. Deliveries out of our areas can be arranged. A surcharge will apply.